The Document page of the Printing Preferences window contains settings for PDF document information and how the PDF document should be opened by the default PDF reader. Document information includes title, subject, author, creator and additional viewer options. 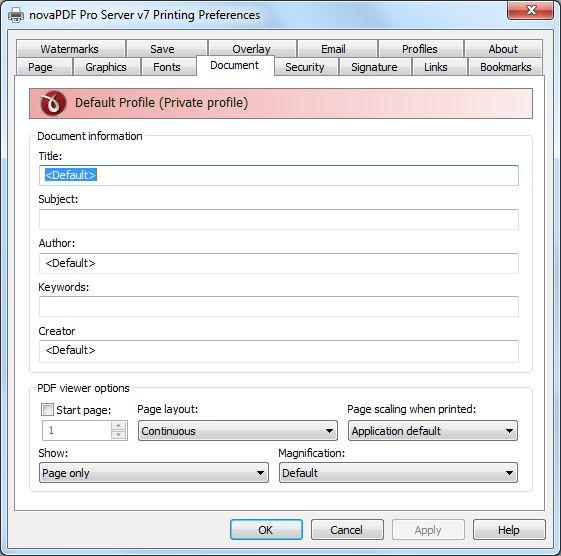 The window can be opened by choosing the Printing Preferences menu item when novaPDF is selected in the Devices and Printers window and clicking the Document tab. This tab is also accessible from the printing Windows application in the Print dialog if you press the Properties (Preferences) button when novaPDF is selected. Document Information - The Document Information is specific for each printed document and should be set on each printing job. If you wish, you can use some tags that will fill automatically the fields with information from the printing job. Title - Sets the document title. If you use the tag, the title will be the name of the document that is printed, as it is sent by the printing application. Subject - Sets the subject for the printed document. Default is empty. Author - Sets the author of the printed document. If you use the tag, the author will be the windows user that started the print job. Keywords - Sets the keywords for the printed document. Default is empty. Producer - Shows information about the application that generated the PDF file. This field is read only and cannot be changed. It will describe novaPDF version and build number. PDF Viewer options - These options will be used by the default PDF Viewer when opening the PDF file. Start page - Sets the page that will be first shown when opening the PDF file. By default, the first page will be shown. Page layout - You can choose form next page layouts: Single Page, Continuous, Facing and Continuous - Facing. By default the PDF file will be opened with the Continuous page layout. Show - You can choose to show some viewer panels when PDF file is opened: Pages Panel, Bookmarks Panel, Layers Panel, Attachments Panel. You can also choose to show the pdf file in the Full Screen mode. By default the PDF file will be opened without any panel, show Page only mode. Magnification - You can choose the magnification when opening the PDF file in the PDF viewer: Fit Width, Fit Height, Fit Page or a percent between 25% and 400%. If you choose Default for magnification, the PDF viewer will use its default settings. This tutorial explains how to use novaPDF (along with other useful tips) to optimize your PDF file for search engines. With the novaPDF printer driver you can generate PDF files and perform SEO from any Windows application that supports printing. This tutorial shows how to convert forms created in InfoPath to PDF files using novaPDF. novaPDF is a PDF creator that allows generating PDF files from any Windows application that supports printing. If you don't have novaPDF installed, use the Download page to download and install it.